"I have enjoyed this recipe for years, and now so do my children. The secret to this recipe is the sweet pickles. You can also trade the mayo for salad dressing." Place the potatoes in a large pan of water and boil over medium-low heat until tender, about 12 minutes. Drain the potatoes, and place in the refrigerator to cool. Stir the onion, sweet pickles, and mayonnaise into the eggs, and let the mixture chill in the refrigerator at least l/2 hour to blend the flavors. Mix in the chilled chopped potatoes, and refrigerate for at least 1/2 hour. Serve cold. 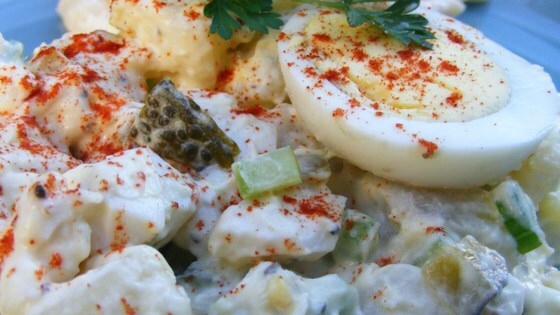 See how to make a classic potato salad with eggs, sweet pickles, and mayo. Very good and I'm not a big fan of potatoe salad. I did add a little musturd and sprinkled paprika on top. I would almost say: this is Dutch potato salad at its simplest, but......very tasty. Almost like mine, except I use slaw dressing with my mayo, and I add chopped celery, to suit my hubby. I have to make my potato salad at every get together. Yummy good. This recipe is just like my mom's, except she adds crumbled bacon. It's absolutely fabulous with the bacon!! Great potato salad recipe. I added about a teaspoon of yellow mustard to half of the recipe. Yummy!